The conceptual model for the curriculum is based on the goals of the College of Nursing, the understanding of nursing as a discipline and a profession, and the understanding of educational theory. The model is learner centred with recognition of nursing practice areas and environments, and acknowledges the principles that will drive the curriculum. It sets the stage for our teaching process and is broad enough to encourage many perspectives that will evolve during the life of the curriculum. The conceptual model for the curriculum is congruent with the concepts of the medicine wheel, a well known model of health among Aboriginal peoples. The province has a significant number of Aboriginal people and the proportion of this population is increasing. According to the 2011 census, there are more than 157,740 Aboriginal people in Saskatchewan (15.6% of the population) and this number is expected to more than double by 2050, when it is predicted that one-third of the province will be Aboriginal. The number of Aboriginal students in the current nursing program is the largest in the country. It is appropriate that the University of Saskatchewan College of Nursing curriculum harmonizes with Aboriginal perspectives of health. The medicine wheel represents the sacred circle of life and is organized around the four directions (east, south, west and north) and the four layers of life, (self, family, community and nation) all of which can be seen within the curriculum framework. The inner circle represents the individual (learner) in the medicine wheel. 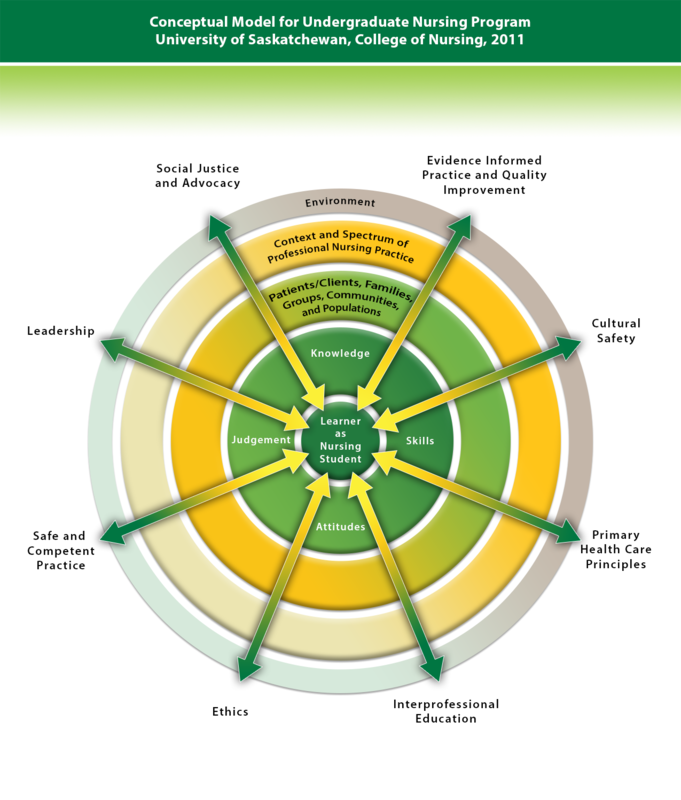 In the second circle, the types of learning expected are placed in the directions corresponding with the four directions depicting the holistic perspective of nursing care. An explanation of why the medicine wheel is appropriate in the model of student centred learning is that the student who is placed at the centre of the learning circle will acquire and demonstrate the following components in learning: skills (EAST/ Physical dimension) will be practiced with respect, kindness and vision; attitude (SOUTH/Emotional dimension) will be shown by honesty, in relationships developed and in time association; judgement (WEST/Mental dimension) will be demonstrated with responsibility, nurturing and reality acceptance; and knowledge (NORTH/Spiritual dimension) will be shown in efforts to seek and value intuition, wisdom and experience. The third circle represents the context of nursing practice, including the aspect of "community" in the medicine wheel. The outer circle is the societal environment in which nursing practice occurs, including, the aspect of "nation" in the medicine wheel. The medicine wheel is a framework by which individuals, families, communities and nations can assess their level of health and wellbeing, to find a place of balance. Ideally, students will graduate from the program as balanced, healthy nurses. As recognition of the history of Aboriginal peoples in our province and of their continuing role, it is our intent to include Aboriginal context in each nursing course in the curriculum and to prepare nurses to interact and offer respectful care. Carper (1978) described four patterns of knowing for nursing; empiric, ethics, personal and aesthetic. All are useful in planning nursing education. Knowledge is acquired in unique ways and world views are acknowledged as influential in that acquisition. Diverse ways of being are accepted and recognized. The curriculum model fits with other world views as various cultural perspectives are incorporated into teaching modalities to respect the demographic diversity of Saskatchewan's residents as well as those in Canada. The College of Nursing's Integrated Plan's goal to support ‘excellence in scholarship' in objective 5.10 states that "we will have a rational, consistent framework for global issues in the curricula..." The curriculum model fits with that objective as well.